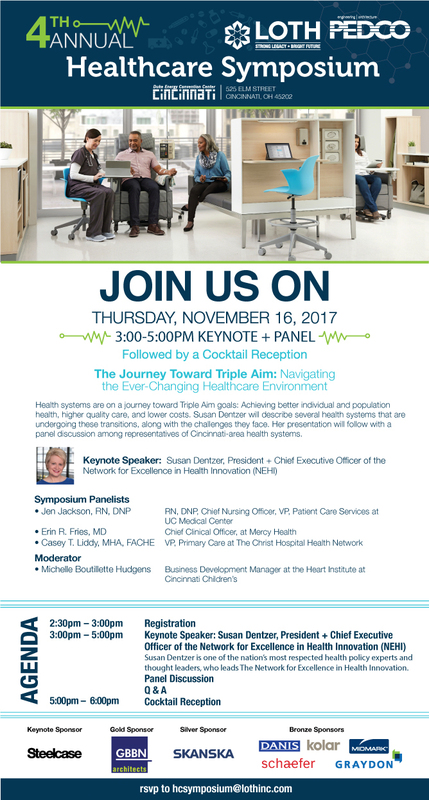 Join LOTH + PEDCO for our 4th Annual Healthcare Symposium in Cincinnati, OH. This year’s discussion is “The Journey Toward Triple Aim: Navigating the Ever-Changing Healthcare Environment”. Speaker Susan Dentzer will join us from the Network for Excellence in Health Innovation (NEHI). Health systems are on a journey toward Triple Aim goals: Achieving better individual and population health, higher quality care, and lower costs. Susan Dentzer will describe several health systems that are undergoing these transitions, along with the challenges they face. Her presentation will follow with a panel discussion among representatives of Cincinnati-area health systems.